Last night we had no plans on what to make for dinner. This whole week has been a very unorganized or us. We didn’t make any kind of a meal plan this past weekend and only went to Sam’s to pick up veggies. Lack of organization is bad for us. If we don’t know what we are going to make then we just don’t make anything and go out to eat instead. Tuesday night we ate Jimmy Johns and Wednesday night we had Pizza Hut. Last night as we were pulling out of the parking lot at work, Karl asked where we were going for dinner, not what we were going to eat. My answer was home because I couldn’t stand for us to spend money on another high-calorie meal. When he asked what I was making I told him I would figure something out. 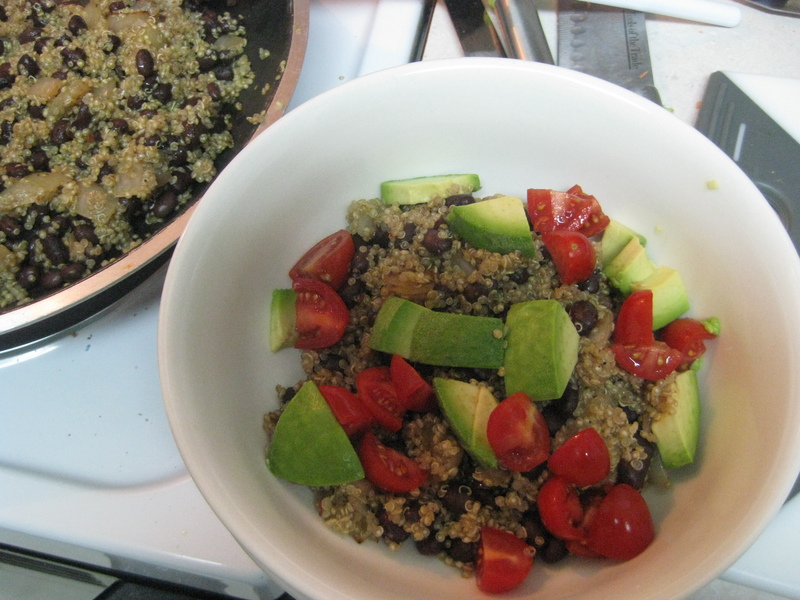 First I cooked up some quinoa. I always make half of what the box suggests (1/2 cup quinoa and 1 cup of water instead of 1 cup quinoa and 2 cups water) because when paired with other foods half of the cooking suggestion is more than enough for the two of us. I seasoned it with some salt, black pepper, about a tablespoon of cumin, and about a teaspoon of chili powder. 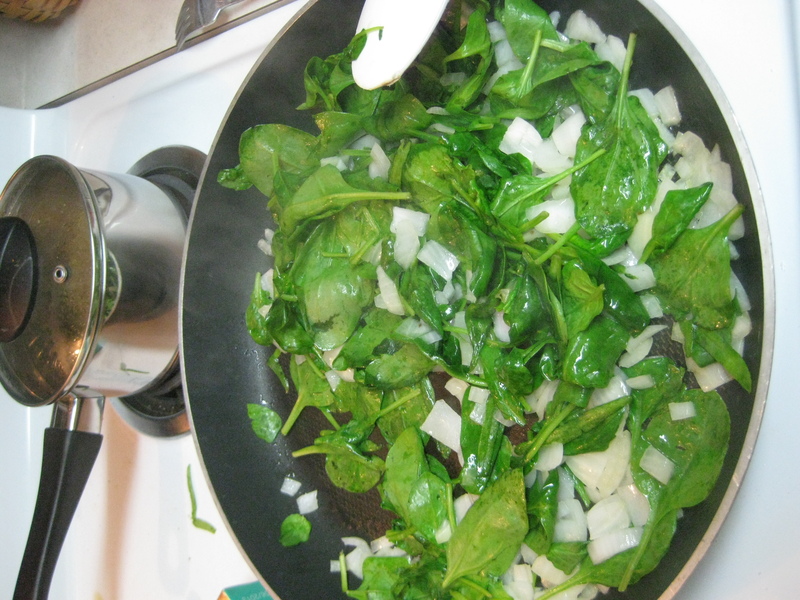 While the quinoa was cooking I chopped up an onion and sauteed that with a couple big handfuls of spinach. Onions and spinach with quinoa simmering in the background. While those sauteed I went to work chopping other vegetables… an orange bell pepper, a baby cucumber, and some grape tomatoes. At this point Karl decided to come in the kitchen and help by turning our two almost overripe avocados into a quick guacamole (one of his favorite foods!). After the onions began to soften I added the pepper and cucumber and let them cook for a few minutes. I took this free time to open a can of black beans and rinse and drain them. 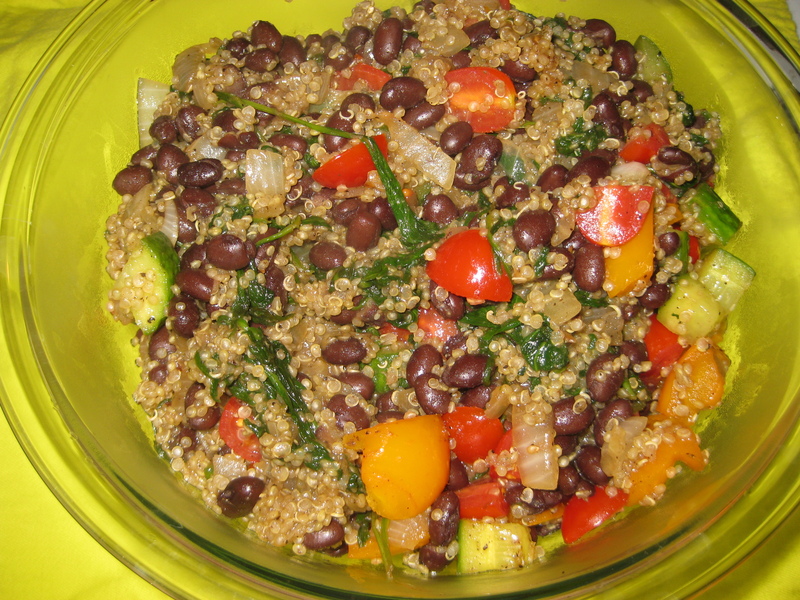 My next step was to thrown in the beans, then the quinoa. I seasoned the whole thing with some more salt, pepper, cumin, chili powder and a little garlic powder as well. I let this heat up and then added the grape tomatoes. It takes no time at all to heat up the tomatoes, so about a minute later I was plating this baby. I served it with a dallop of gauc and a light squeeze of lime juice on top. It was so quick, so easy, and so delicious. Cooking a meal like that makes me realize how easy it is to make a healthy dinner every day. I guess that means I have no excuse for going out to eat, even during the week? This meal will definitely be a repeat item for us! Karl loved every bite, but I guess what meal isn’t good with a little guac on top? I’m sorry I don’t have a real “recipe” to share. I really just eyeballed everything except for the beans (1 can) and quinoa. But you should seriously give this a try. 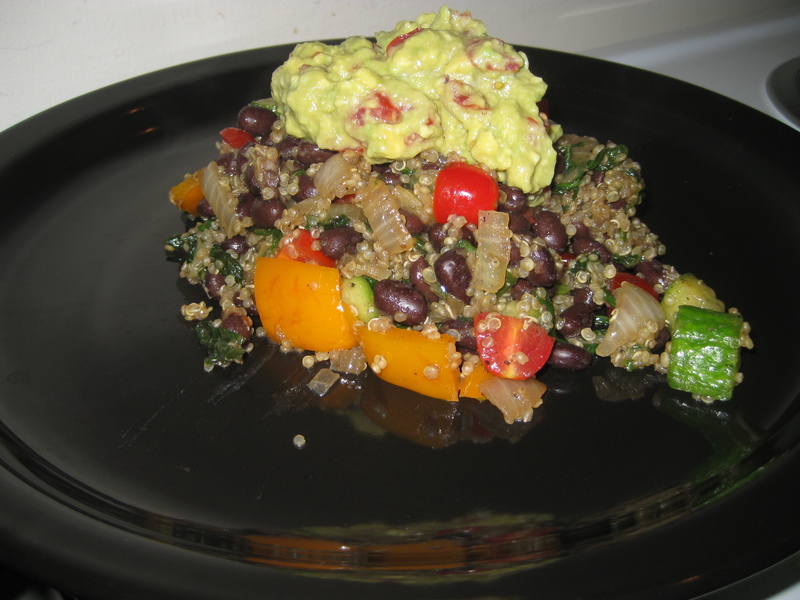 Throwing a bunch of veggies together is very forgiving – they almost all taste good together! I guess that’s why I do it so often! Enjoy!! 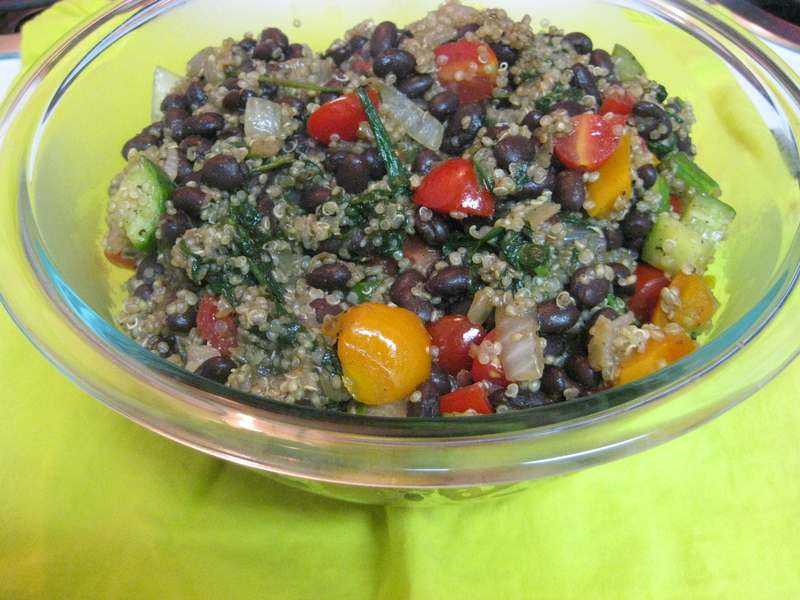 Categories black beans, cooking, healthy living, recipes, vegetables, vegetarian, what's for dinner? For dinner yesterday I decided to try a recipe I had found on another blog, Daily Garnish. For awhile now Karl and I have been trying to cut down on the amount of meat that we eat to try and eat a larger variety of foods such as beans, healthy grains, and more vegetables. I don’t know that either of us are capable of making the full-on plunge, but we have made great strides in trying to cut back some. For instance, for lunches we now take salads topped with chickpeas to work instead of a turkey sandwich. Changing our diet has also made us expand our horizons a little. 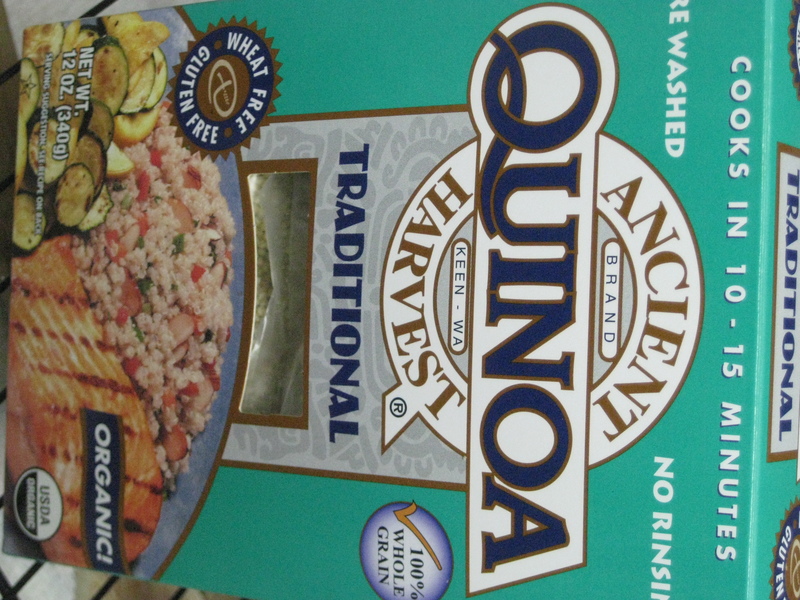 One of the new foods we have tried and really liked is quinoa. Its a little round grain that has a little tail kind of thing that pops out when you cook it. We’d heard about it a lot, but until about a month ago we’d never made the effort to try it. Its got a lot more texture to it and fills you up a lot better than just plain brown rice and you can season it however you want just like rice. If you’ve never tried it before I would definitely recommend it – its a great way to introduce some variety into your diet! This recipe piqued my interest because it is something different from the usual black beans and rice (I think we’ve eaten that a few too many times now). 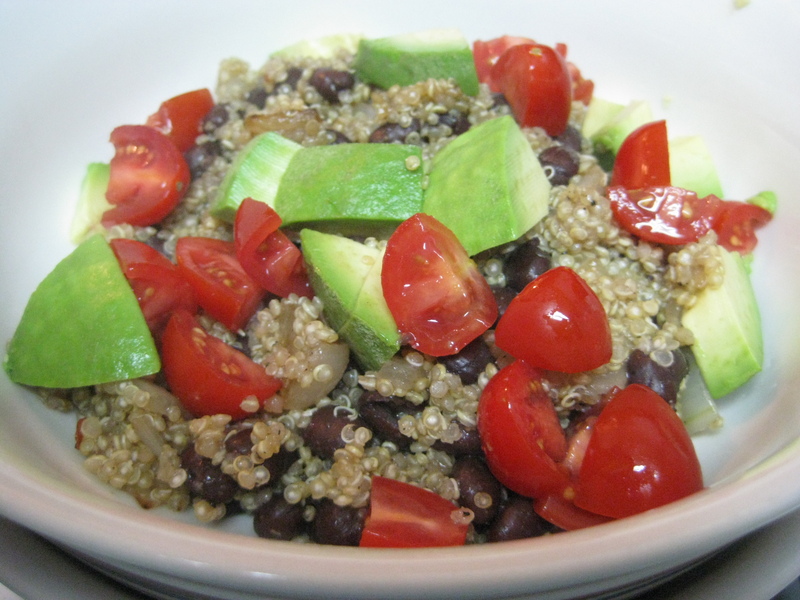 The other really great thing is that it cooks up so fast – the only thing you really have to wait on is the quinoa! We literally walked in the door at 5:30 and were eating before 6pm. I modified the recipe a little to fit our tastes; feel free to do the same! Prepare quinoa as instructed on box. 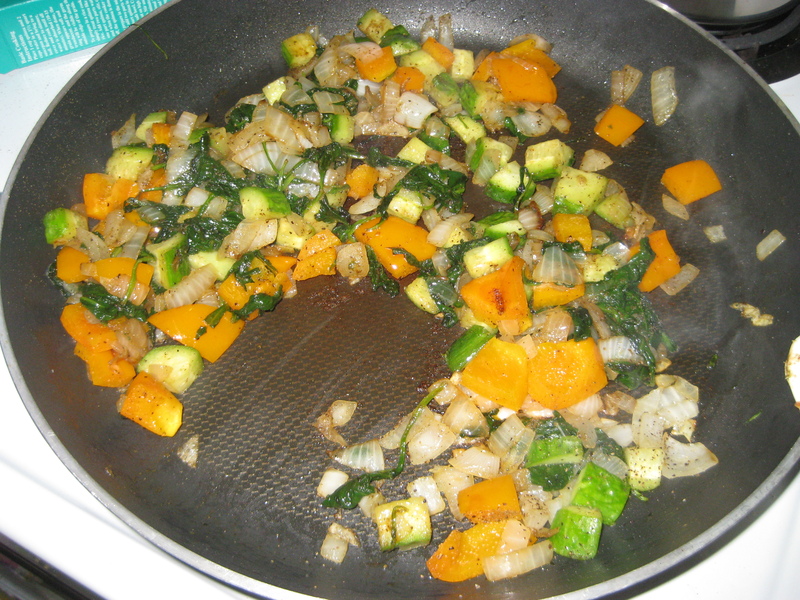 Season to your tastes – I add some cumin, garlic powder, black pepper, and salt. 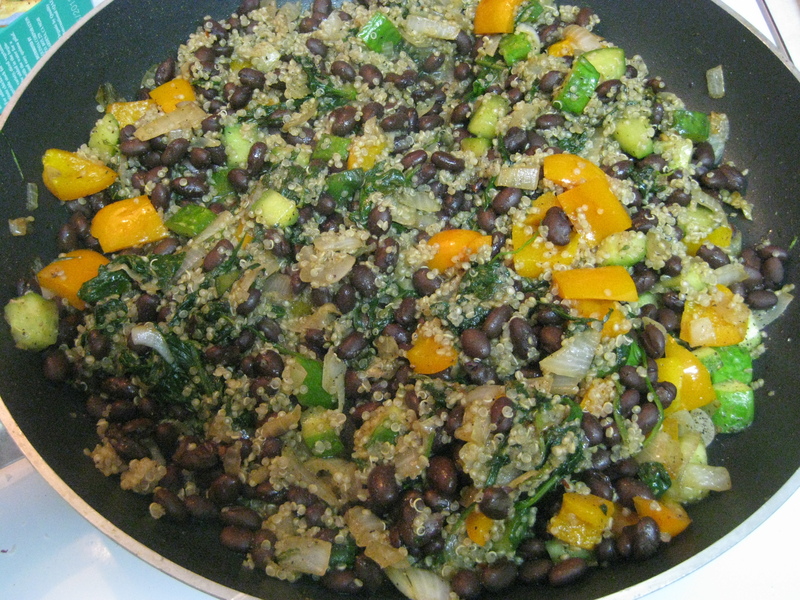 After the quinoa has finished cooking, add it along with the black beans to the pan with the onions. Stir to combine and heat through. Add 2 tbsp. lime juice and reduce heat to low. Stir in tomato and avocado and leave over heat until they are just heated and season again as necessary. Top with some chopped cilantro and enjoy! YUM! Hope you enjoy it as much as we did!